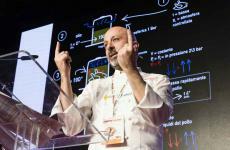 Only Massimo Bottura- who on top of being the great chef we all know, uses his virtuous story-telling full of adrenalin as his weapon of mass fascination - dares to tease the guest and friend: «He’s convinced he invented panettone! And balsamic vinegar too! Ah, no, actually he says he’s just improved vinegar!», the audience cheers and laughs. 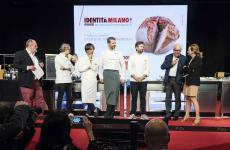 As for the other people on the stage, other attitudes prevail: Carlo Cracco is stuffy and polite; Davide Oldani is respectful, he offers the French chef a gift (aCavallina Steph, a design chair, entirely made of leather, signed by Stefano Conticelli’s prestigious Bottega Conticelli in Castel Giorgio, in Umbria); Andrea Berton seems a little touched too, as if his strong Friulan armour has melted a little. 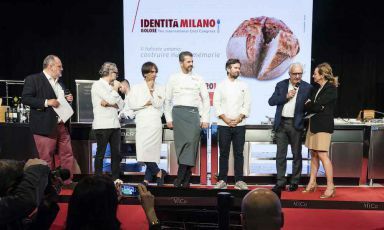 Four stars celebrating a star, or rather a superstar if you wish, «it’s the first time in the history of Identità Milano that we pay homage to a foreign chef», Paolo Marchi points out from the stage, calling Dudu, this is the nickname Henri Gault gave to the French master of cuisine, monsieur Alain Ducasse. The latter, follows his usual role: he goes along with docility and kindness, keeping a distance, but only just enough, which just confirms what everyone already knew and now is being whispered around the audience: «How elegant! What a lord!». Ducasse is anything but cold and accepts a surprising number of selfies. This is after all a surprise only for those who don’t know him well. 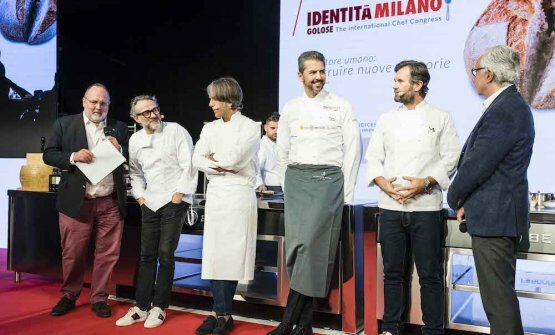 He has nothing to do with the French snob stereotype, «I remember that time when we invited him to Identità Londra - Marchi goes back down memory lane – We didn’t know if he would accept, so when he arrived as a surprise, we weren’t ready to welcome him. And he just waited patiently in the queue to be registered». Alain smiles. 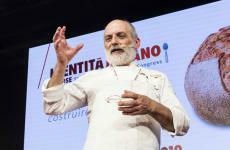 And speaks: «Italian and French cuisine are deeply connected. Even in my case, when creating the dishes for my restaurant Le Louis XV in Monte Carlo, I found a lot of inspiration in your cuisine. 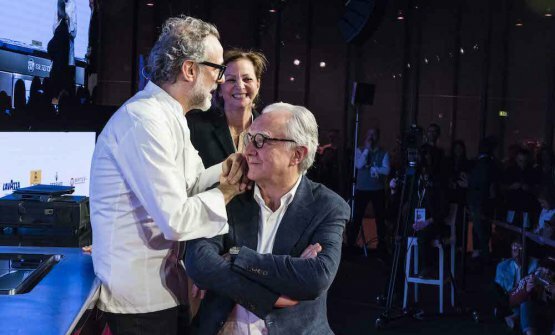 I started from your foundations and improved them – here’s a cutting remark served with a smile – And the reason why we’re now here with Berton, Bottura, Cracco and Oldani is that each one of them has been at Louis XV, and learnt rigour, discipline and the necessary techniques for fine dining». 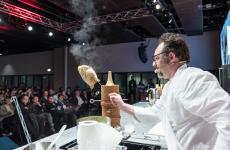 Bottura adds a meaty detail: «True. 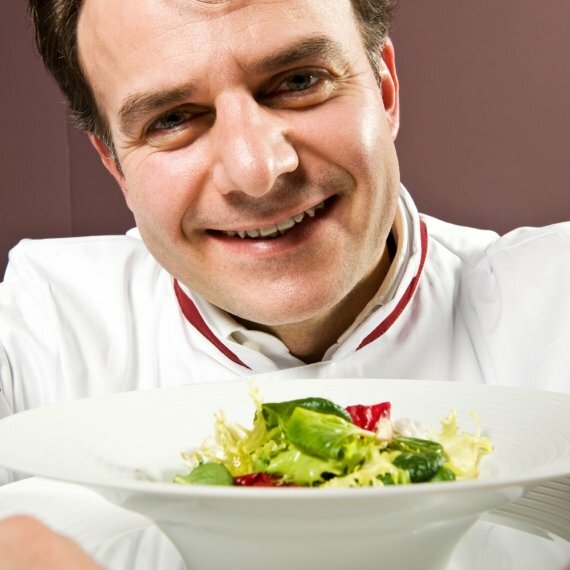 It was 1994, I had sold Trattoria del Campazzo to do an internship at Louis XV [the following year, he opened Francescana]. At the end, I had a notebook full of details on everything I learnt. Ducasse tore it into pieces, in front of my eyes. We didn’t speak for two years, but then I understood». What he meant was, is: you’ve learnt plenty of things here. But now you have to develop your own style, you mustn’t copy me. 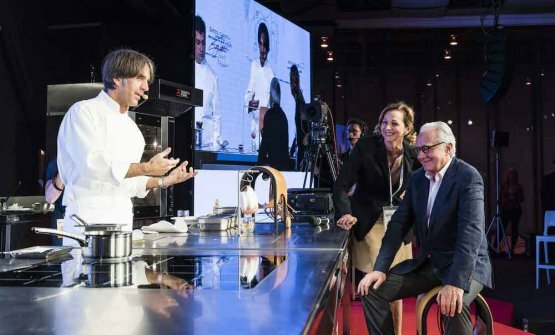 «Today I must say – the chef from Modena continues – that my cuisine has more references to Ducasse’s obsession with quality than, for instance, to the techno-emotional lesson, so to speak, given by Ferran Adrià. 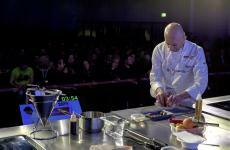 See it, eat it: this was Alain’s crucial lesson». 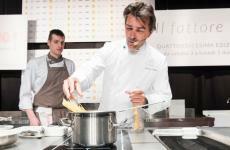 On the stage of Identità every pupil thought of a dish to dedicate to their master, inspired by his own dishes. Andrea Berton begins. 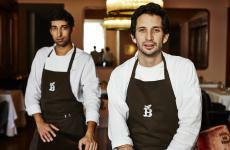 At Louis XV he spent three years, from 1993, «after Oldani and Cracco. 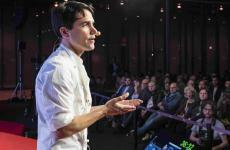 That time gave me the opportunity to understand cooking from an entrepreneurial point of view. 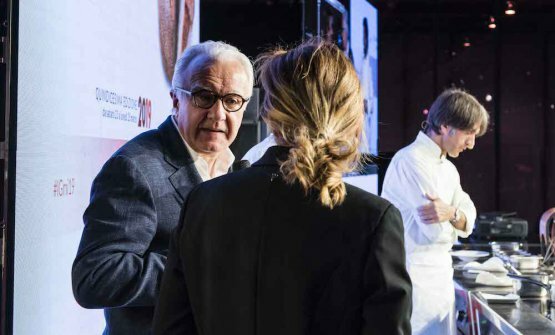 Ducasse was the first to understand, and make others understand, that you can offer the highest quality, even when running multiple restaurants. It’s a crucial lesson for a modern cook». 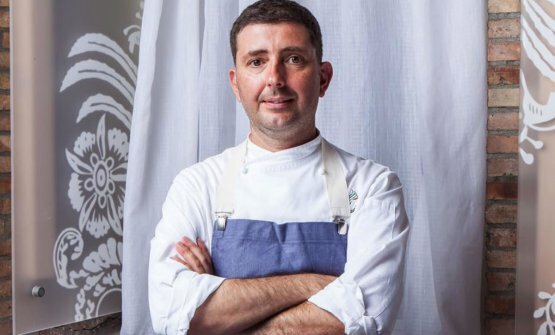 The Friulan chef continues: «I spent the first three months in Monte Carlo perfecting vegetables all day long». They were necessary for one of the cult dishes there, Vegetables from the kitchen garden with black truffle cooked on a low flame. 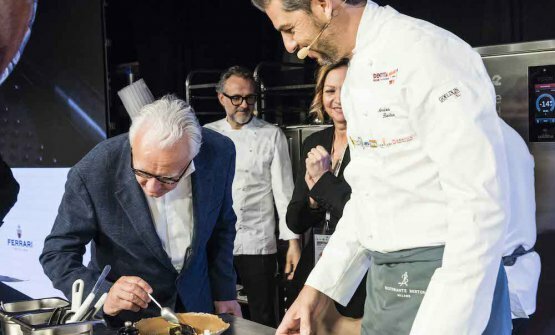 Then Berton prepares a sort of vegetable cake, the base is a disc of potatoes, the edges are made with beetroot and black truffle; inside, a brunoise of carrots, courgettes, broad beans and peas. 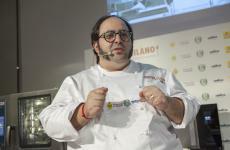 «I also added – says the king of broths – a broth of asparagus and black truffle». Plus a drop of extra virgin olive oil and balsamic vinegar, instead of the Jerez vinegar that Ducasse uses for its "twin". 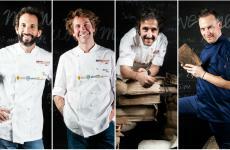 The French chef’s comment: «Well done Andrea. I love this type of flavours, it’s the perfect sublimation of nature». 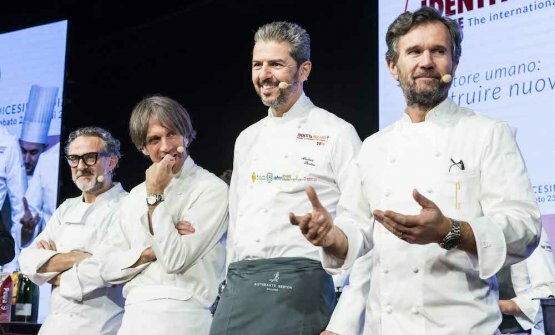 Now to Carlo Cracco, who at Louis XV (and the other gourmet restaurants at Hotel de Paris in Monte Carlo, where the latter is located) spent one year and a half, starting in 1989, at the very time of the third star. 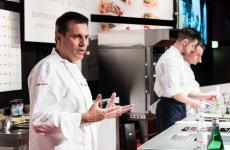 «I had never used morilles (morels) which were very popular there. The same goes for truffle: I remember a car trip to Alba to get our supply, Alain was driving, very fast, it took him an hour and a half to get there, I was sitting beside him, terrorised. 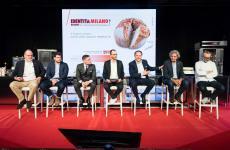 On the way back – with the car now full – I thought: "Maybe I’ll die, but at least they’ll find me in a sea of truffles"». 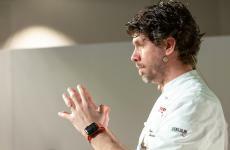 Cracco prepares a Soup of morels and bianchetto truffle: a reduced broth of mushrooms, pears, marinated and fermented, some shaved truffle and, using the parts of the truffle that are not so good looking, a cream on the base, with walnuts cooked in milk and then dried. 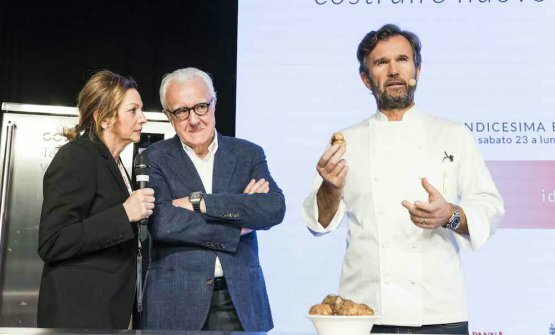 Ducasse: «It recalls flavours I feel like my own, but with an original touch that belongs to its author, and represents Italy». 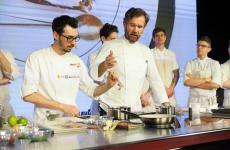 Cracco: «Alain taught me rigour, the need to always aim for perfection. He knew how to make you grow, understand. He empowered you. 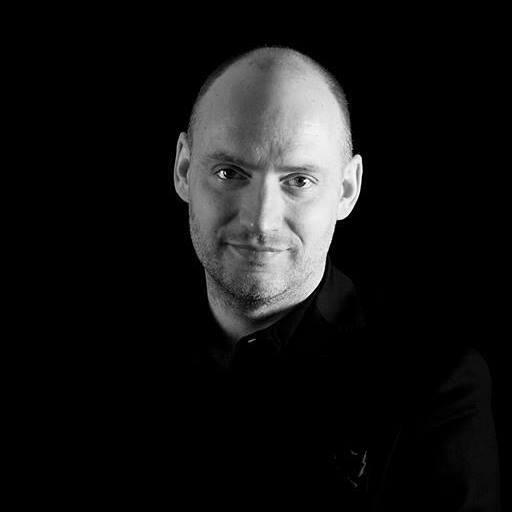 It’s a pleasure to have him here now with us: at the time, we felt lots of awe. Nobody dared speak to him!». 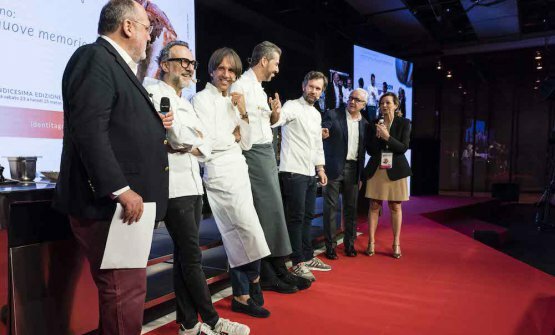 Davide Oldani recalls how he arrived at Louis XV in 1991, presented by the very Cracco. 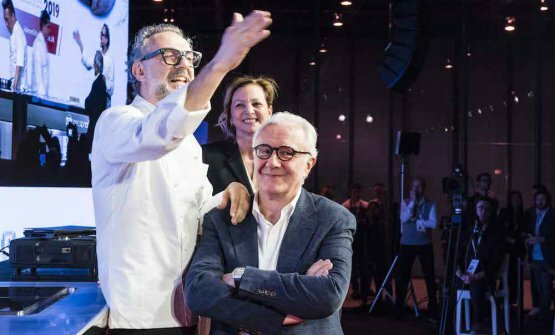 He dedicates to Ducasse a simple Spaghetto with essence of tomato: «I remember that I was always walking between the kitchen and the cell where, in a sack of linen, the tomatoes were decanting. We would make this very clear water. In Italy, we were not used to the idea of a recipe with tomato that wasn’t red. 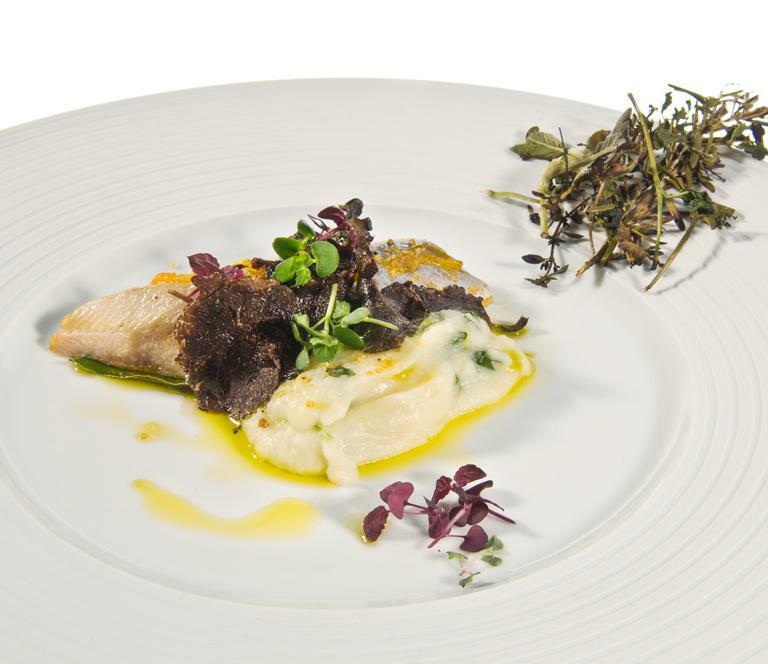 We used it to season turbot with olives, capers and lemon, a Mediterranean explosion». And here comes a simple spaghetti with tomato water, a minimalist dish that is praised by the master, «You have perfectly captured the flavours of nature, preserving them in the best possible way». 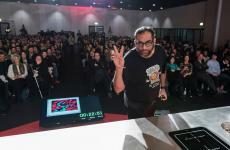 Then he also admits «only the Italians know how to cook pasta perfectly», which – as Bottura points out – it’s a u turn, compared to a famous sentence Ducasse said in the past, when he said he would never open a fine dining restaurant in Italy until Italians agreed on the perfect cooking of pasta, and on the most suitable sauces. Round of applause. 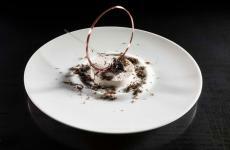 Massimo Bottura ends the tribute: Ravioli with leek, black truffle and foie gras. 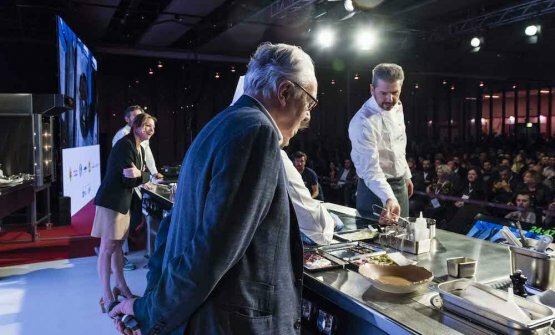 It all started from an anecdote: in 2013, Ducasse and his team replaced Yannick Alléno at the helm of the prestigious Le Meurice in Paris, right in front of the Louvre. «His trusted Emmanuelle called me and said that Alain would be pleased to have me at a sort of opening lunch, by invitation only, "with 60 friends". I say I’ll go, and leave for Paris with Davide, Taka and a fourth person. I find the entire old brigade of Alléno, all angry because of the change, «here come the Italians» I hear them say with a touch of arrogance, and they put us in the corner of a corridor, to prepare the mise en place for the following day. People kept on walking by and bumping into us, Taka who’s really precise, couldn’t stand it any longer». And then: «A little while later, I find out that those "60 friends" are, in fact, 45 French food critics, of course super-snob, and 15 great chefs. I’m dumb folded. Alain explains: "I didn’t tell you before because I didn’t want to put too much pressure". We have a meeting, and I find out the dinner can last one hour and a half at most. I have an idea: I prepare a raviolo – an Italian dish that in my opinion is an extraordinary container of ideas – and I fill it with France, that is to say foie gras, black truffle and leek, with a concentrated broth of leek to cook the pasta as if it were risotto and glaze it, plus a sweet and sour sauce made with reduced riesling wine and finally shaved white truffle». We make it. Time for lunch: «I go out to present the dish to the guests, and I present it like this: "Here’s The dream of a French chef who wants to make pasta like an Italian". Everyone freezes. The silence is deafening. 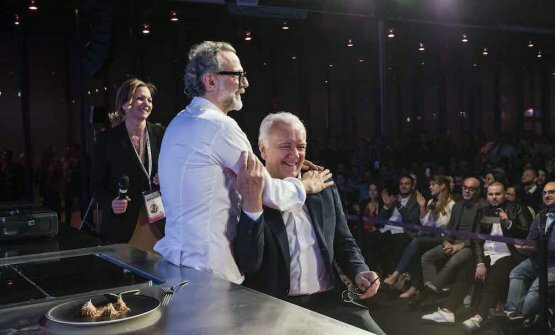 Then Ducasse, while everyone is baffled, tastes the ravioli, then gets up and claps his hands, followed by everyone else». 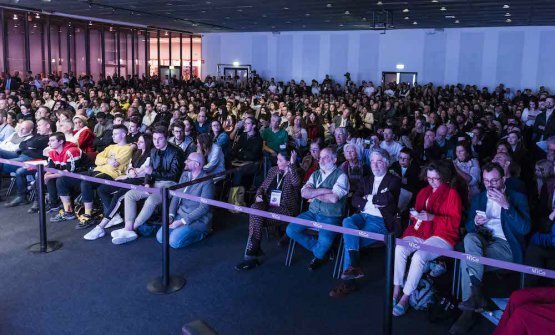 The same happens in the auditorium of Identità Milano 2019, for the gran finale of an unforgettable moment.